Born in Oklahoma City, Oct 7th 1980 but, raised in Kansas City, Mo. ThuggMiss has been ask by several A&R agents for Management signing. 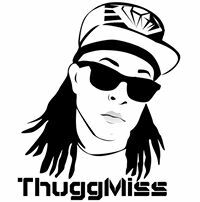 ThuggMiss has also been on a few Tours with Kstylis "TwerkNation Tour". Every summer since 2012 to present, she has her own Promo Tour's, sponsored by SuperStar Promotion S.S.E, BossUpEnt, & WTW Clothing . She also was part of the BassMintPro Natural Disaster Tour (BMP) hitting many states in the Midwest, South, & North. ThuggMiss music speaks for itself. Far from your average female, But a lady about her business. Don't stay where you're tolerated; go where you're celebrated. Happiness keeps you sweet. Trials keep you strong. Sorrow keeps you human. Failure keeps you humble. God keeps you going.